Small Dehumidifier? Mini Dehumidifier? 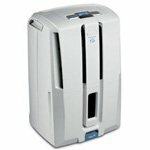 Compact Dehumidifier? A small dehumidifier will always be chosen before a larger model, all other things being equal; but they rarely are! The purpose of a dehumidifier is to maintain the relative humidity in a given space at a level which is comfortable for you, prevents mold, mildew and condensation and is uncomfortable for allergen producing dust mites. The bigger the area the more powerful the appliance has to be. The more powerful the appliance the larger it is likely to be. In this article I will suggest how you might weigh the advantages and disadvantages of a smaller model. My aim is to ensure that if you buy a small dehumidifier you don't end up instead with a big disappointment. What is a Small Dehumidifier? The term "mini dehumidifier" applies to two types of appliance; the rechargeable and the thermo-electric varieties. The rechargeable type is a container for silica gel, water absorbing crystals. The crystals collect water until they are saturated, when an indicator panel changes color. At this point the unit needs to be "recharged" by being attached to an electric socket for about ten hours. The electricity produces heat which dries the crystals, after which the appliance can be re-used. The water extraction capacity of a rechargeable model is small and it will only be effective in a small, enclosed area, such as a closet. The advantages of this type are that it is clean, safe, silent and does not require a power cable, except every six to eight weeks when it is recharging. This is the type we recommend for a closet, a car or a similar area. It will not be effective in a room, however small, or even in an RV. An example of the rechargeable type is the Evadry, seen here. The thermo-electric type uses the "Peltier Process" which transfers heat from one side of a panel, made from two different materials, to the other. Water vapor from the air condenses on the cool side and is collected in a small tray or bucket. This type does not need a compressor but does need a fan to draw in and push out the air. The thermo-electric type extracts more water than a rechargeable unit but we are still talking about a small amount, between half a pint and two pints per day. This is still way short of what would be needed in anything but the tiniest room, and would still be insufficient for an RV. The advantages of a thermo-electric model are its small size and relatively quiet operation. Nevertheless these devices are far from "pocket size", nor are they silent. The disadvantages are they are relatively expensive to buy in relation to their water extraction capacity, are far less energy efficient than the refrigerant type and require a power cable to attach to an electric socket. For most applications we believe that there are more convenient and, often, cheaper solutions. This type of dehumidifier may be preferred in some cases, such as a smaller sized walk-in closet with an electric socket inside. A typical example of a thermo-electric model is the Sunpentown SD652 which you see here. A small dehumidifier is a lower capacity (25 to 40 pint) model and suitable for use in a smaller area, a bedroom, bathroom or compact living area. It is also powerful enough for an RV. The objective, with any dehumidifier is that it should only run for a part of the day to maintain the ideal level of relative humidity. A unit that runs constantly is either faulty or insufficiently powerful for the space in which it is being used. It is particularly important that a small dehumidifier is not for any area for which it is "only just" big enough. Lower capacity models are less energy efficient than higher capacity units; they remove less water per energy dollar spent. 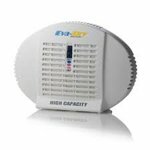 A higher capacity appliance will run for fewer hours per day, in a given area, and the difference in ticket price will be much less than the energy saving. A compact dehumidifier is one of, say 50 pint capacity that is smaller overall than most other 50 pint models. If you need a 50 pint model it may make sense to choose one of smaller dimensions. One point to consider, however, is that most manufacturers' 50 pint models share their casing with the 65 or 70 pint model in the range. Although, usually, a little heavier, the more powerful models are, by my definition, more "compact". They will also run for fewer hours, saving money and reducing the duration of the noise nuisance, which all these appliances produce. If you want a unit for your basement a compact dehumidifier may be less important than an energy efficient model so, for most folks, I would recommend a larger capacity unit. Compact models are most often needed in smaller rooms, and other restricted spaces, such as RVs. If you need your appliance to be both small and compact there are two models I would recommend. These are the DeLonghi DD45, or the DD45P dehumidifier with pump, and the Soleus CFM25E, both of which are illustrated below. Whether for a small room or an RV these two models are small dehumidifiers yet more than capable of doing a good job where a larger unit would be impractical. For those of you who are wondering why there are no powerful models that are both compact and small the simple answer is they would be too expensive to build and unlikely to attract many buyers because of price. The most outstanding examples of powerful, compact and small dehumidifiers are crawl space models, such as those sold under the well known Santa Fe brand. These units have to be effective in cooler places and they also have to be small to fit into the restricted area available in most crawl spaces. The result is that we are taking about prices of around $1000 per unit which, I guess, most folks would not be prepared to pay for a portable. For most situations I would encourage you to put a lower cost ahead of a smaller unit on your list of priorities, unless you have a space so restricted that only a small appliance will do.